Agents E and C concluded their four days of top secret assignments on Father’s Day. We went out to a nice brunch at another hotel to celebrate and while waiting for Uncle Tawn to show up from yoga class, they completed their last assignment, a “final report” to headquarters. To verify their identity, though, they had to complete the following puzzle to prove that they are the actual secret agents to complete the mission. After all, there were a lot of double agents out there and more than enough subterfuge to fill a bathtub. 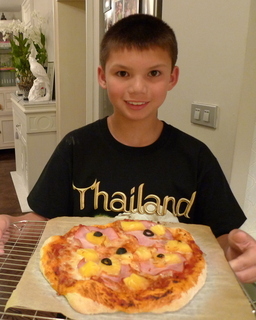 The only hint you should need is that they stayed at the Windsor Hotel on Sukhumvit Soi 22. The rest you might be able to figure out on your own. I’ll print the answers tomorrow. After brunch I drove to the secret agents and their father back to our condo where they started running some loads of laundry in preparation for their trip to China the next day. Meanwhile there was time for a few hours of playing around in the pool. I’ve concluded that young people will pretty much enjoy any vacation so long as there is a pool to play in. Which begs the question, why bother to travel halfway around the world? While the agents were showering and changing into fresh clothes after their swim, I baked a batch of oatmeal raisin cookies. Thankfully, there were a few people willing to taste test them. Meanwhile, Tawn took Donna to the Jim Thompson outlet for some silk souvenir shopping. As the afternoon progressed, we broke out a deck of Uno, playing with modified rules that made the game much more competitive. 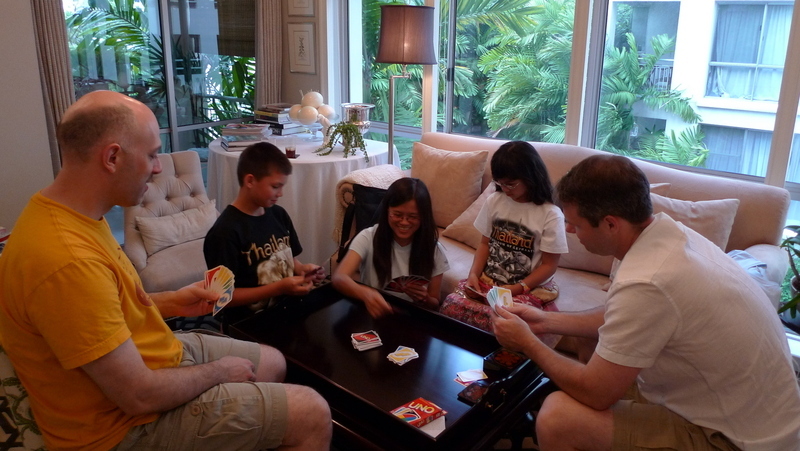 Whenever someone plays a “zero” card, for example, all players pass their hand in the direction of play. So you end up having to change your strategy again and again while playing. 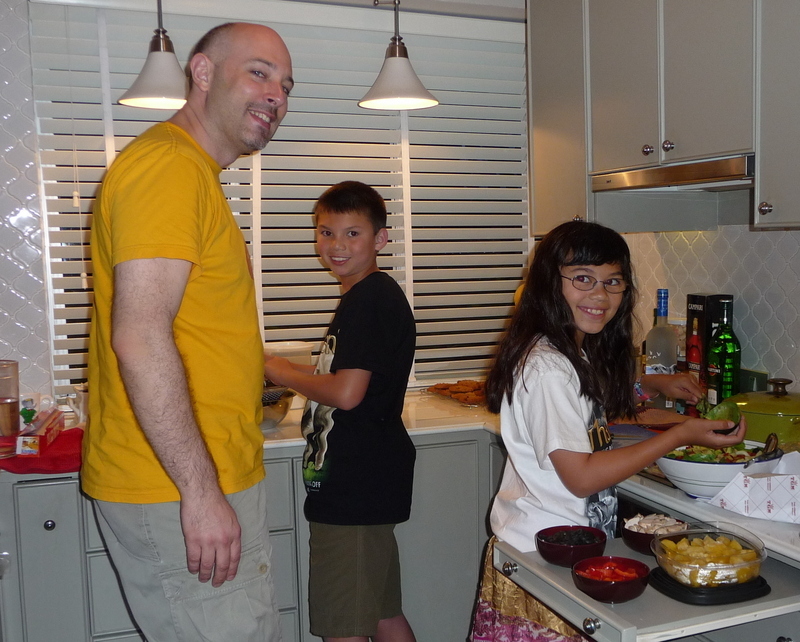 As dinnertime approached, Agents E and C were pulled into service, helping prepare salad and grate cheese for pizzas. 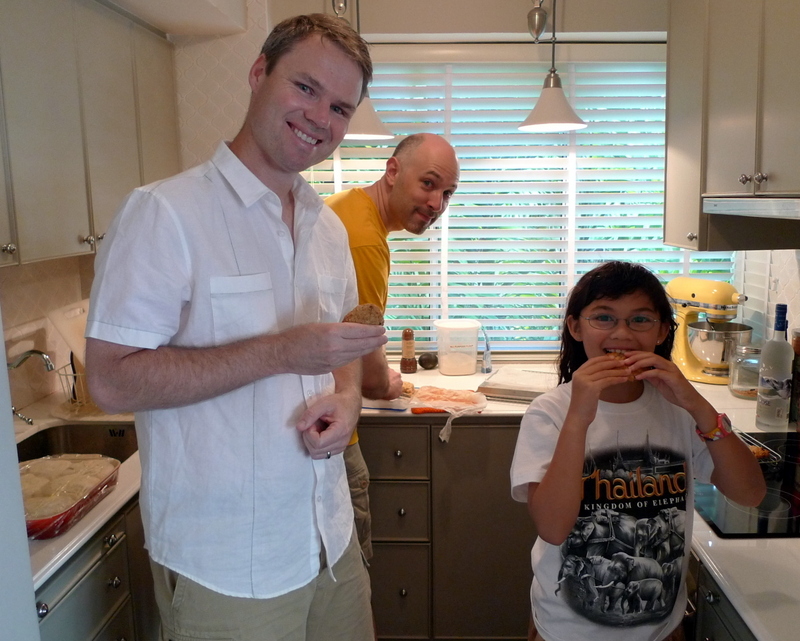 Then they learned how to press out their own pizza dough from a batch of dough that I started the day before. 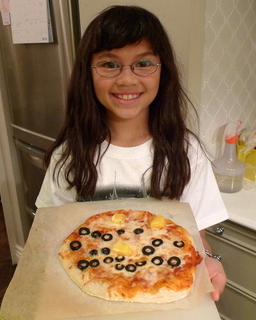 Each of them created their favorite type of pizza – ham and pineapple for Agent E and olive and pineapple for Agent C.
It turns out that the top secret agents also have some cooking skills. Agent C, left, had tried to arrange her toppings in the shape of a cat’s face, although I think it is hard to tell the eyes and the whiskers apart. 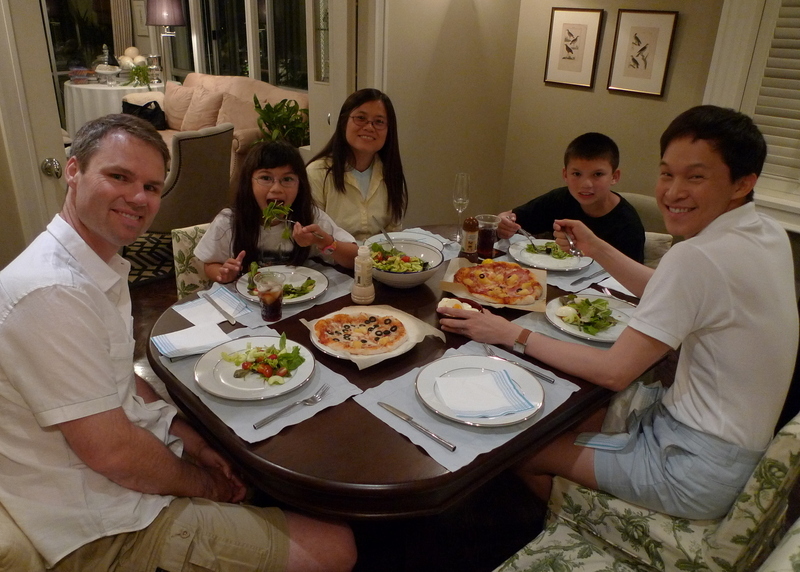 We enjoyed a nice home-cooked dinner to conclude their visit, complete with some more oatmeal cookies and vanilla ice cream for dessert. The next morning, bright and early, I picked the Clevelands up from their hotel and drove them out to the airport. After checking them in we snapped this final picture. 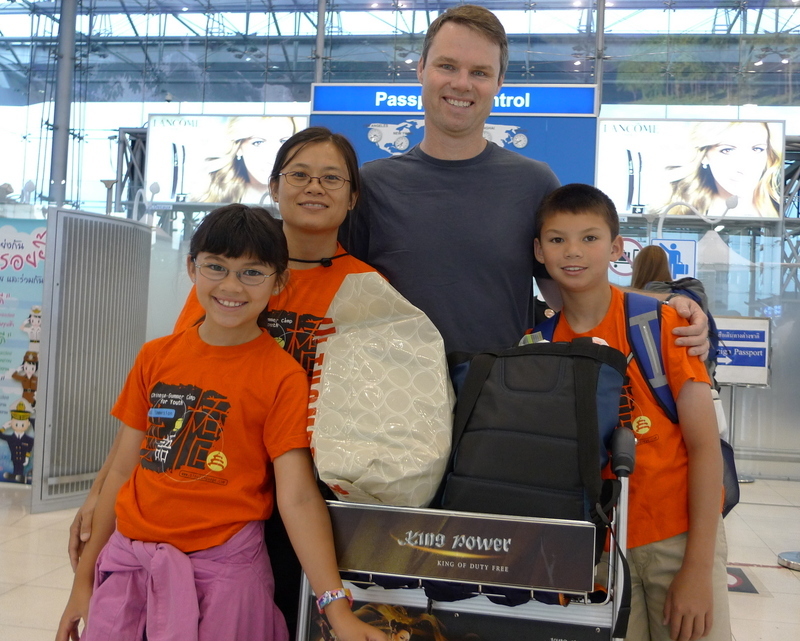 As we were checking in, Donna told me that Agents E and C didn’t want to leave Thailand. But I’m sure they will have a great time with their schoolmates on a three-week excursion in China. 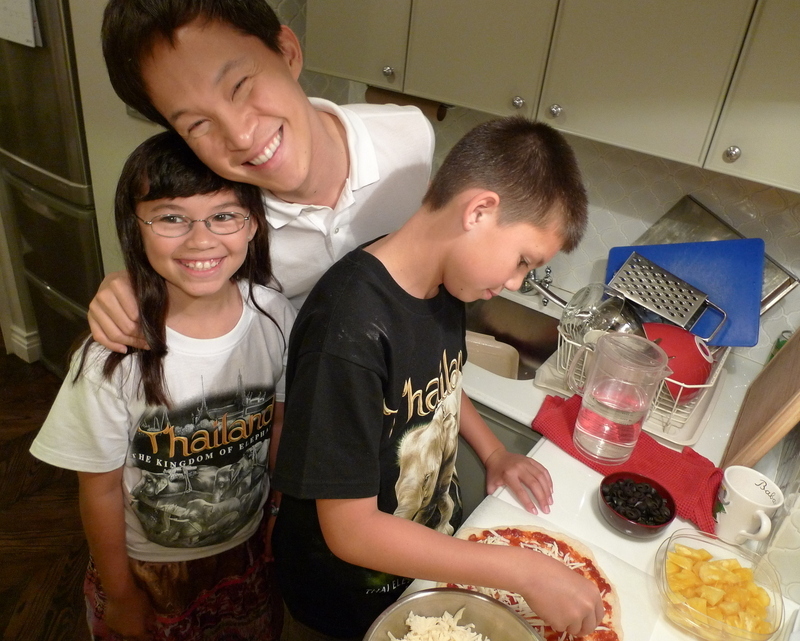 This entry was posted in Uncategorized and tagged Clevelands, pizza, Thailand by christao408. Bookmark the permalink. That was a fun trip afterall! You’re so nice to device the whole itinery and host a ‘family’ dinner. By the way, did you plan that crossword puzzle? Just curious. 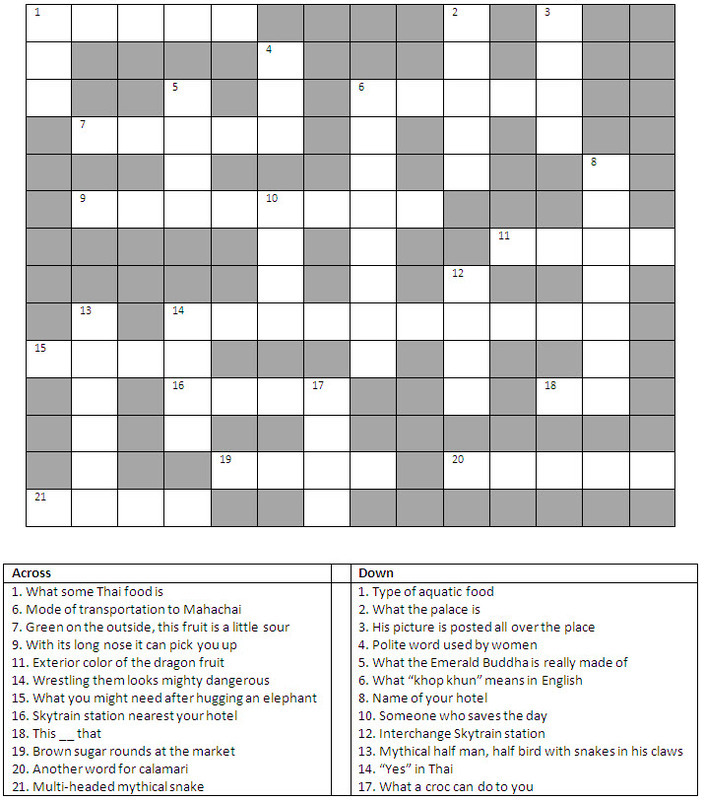 You actually made that crossword?? ?I love Uno! It’s one of my favorite games. Yes, a pool always made my vacation when I was little. I’m still excited when there is a pool! So fun!UNO is the bomb. What a wonderful family! So glad that you made it such great fun for them Chris. @Dezinerdreams – @CurryPuffy – Yes, I did create the puzzle. There is an online tool you can use (a teachers’ resource) but their server was down so I had to pull it together by scratch. Not so hard – just create a blank grid and plug in words. Once you’ve set the locations, make a copy and fill in the blank squares with black, then erase the answers, add numbers, and write clues. Hmm… when I describe it that way, it does seem like a lot of work. LOL@yang1815 – Get your deck out for July. @TheCheshireGrins – Especially doing hand-stands in the pool. Now, THAT’S fun! @ZSA_MD – I really enjoyed having them visit and it was worth every bit of effort. Thank you to you and the Clevelands for sharing this part of their trip with us. It was a wonderful visit. @christao408 – You sir, are on like Donkey Kong!!! @marc11864 – I’m glad you enjoyed it Marc. @yang1815 – Special rules or normal wussy rules? @christao408 – I guess normal wussy rules haha. Well it has been a wonderful time for your friends and the agents and I can well imagine the stories they will tell their school friends and teachers when they get back home. You have made a wonderful and imaginative host Chris and provided them with some awesome memories of their wonderful holiday. Thanks so much for sharing all this with us ! @Chatamanda – I’m glad you enjoyed it and I hope they did, too.